You never know when your world will suddenly pause, the news of a death freezing all plans and prompting you to wonder at how time slips away so fast. That’s how I felt when my dad called one late July day in 2009, just hours after my husband, children and I had arrived home from a two-week overseas trip. His wife Beverly had just passed away, he informed me. She had been sick for many years but had fought death for so long we were never sure when the end might come. Jet-lagged and disoriented, I flew to Idaho the next day to be with Dad. He picked me up at the airport in Spokane, Washington, in his brand-new Mercedes Benz. Typical dad; he refused to wallow in the past. “I might as well have the car I always wanted before I die,” he said, a hint to the prostate cancer that experimental therapies had stymied for years but which recently had resumed a steady creep through his body. 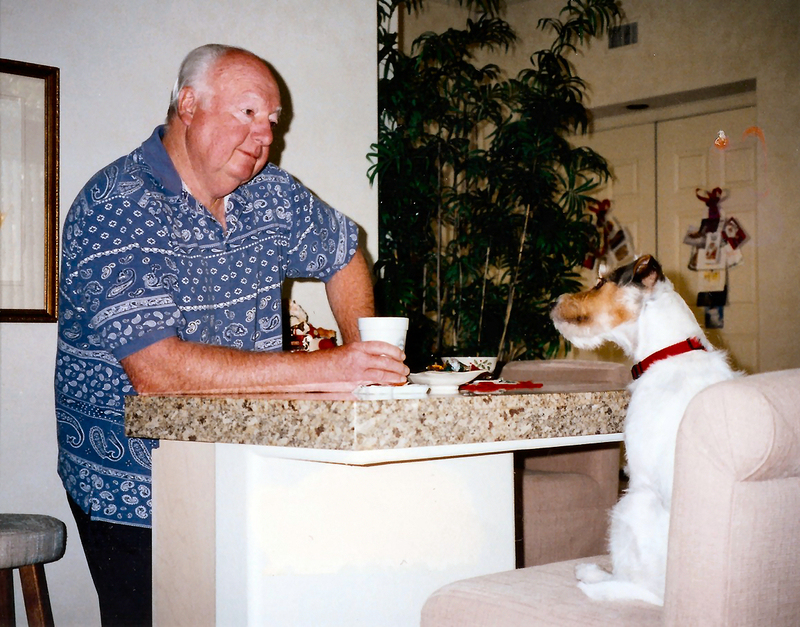 During the 45-minute drive to his home, we talked about plans for his wife’s remains, how to get her two sons to Idaho for a memorial, the activities of my sister who had arrived a couple weeks beforehand, and my European trip. I entered his home and my sister promptly appeared in the foyer, dragging behind her bulging Hefty bags and announcing she had cleaned out our stepmother’s closet. 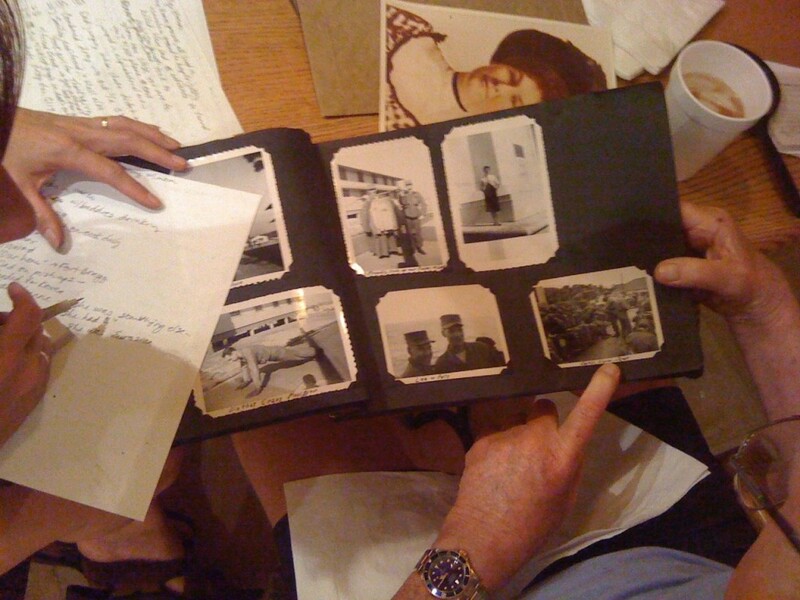 She then brought me to the upstairs entertainment room and showed me a pile of photographs scattered on the floor. “I thought her sons would like their family photographs,” she replied. 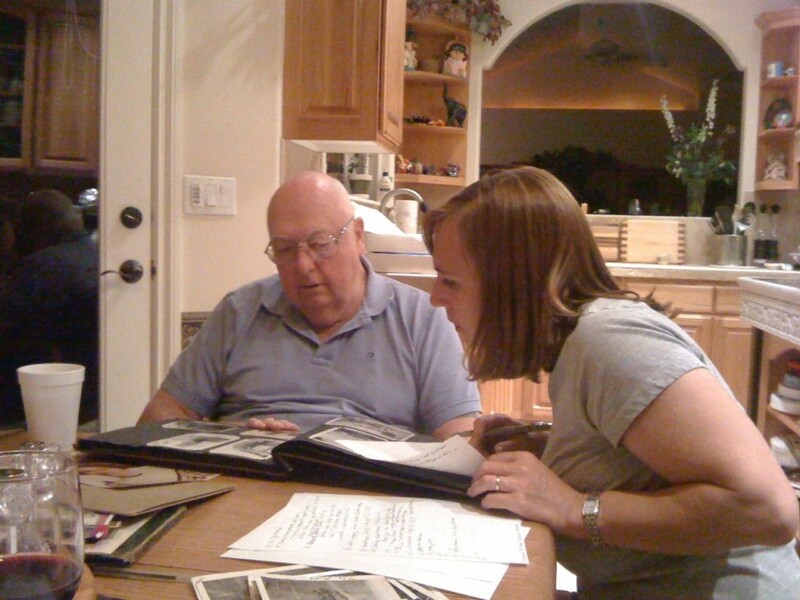 This is where I knew I could help, with my longtime love of photo preservation and interest in family stories and genealogy. I sat cross-legged on the floor sorting through piles of bright yellow paper packets from the photo developer. I easily discerned the pictures belonging to our stepmother’s family, and separated those from the hundreds of photos from the trips my dad and she had taken. I then scoured the house for more, eventually finding in the living room bookcases an old family album of my father’s and a military album from his days in the Korean War. Both books had hundreds of photos glued onto black or white pages and only a scattering of identifications written in someone else’s writing. That night after dinner, I set the albums before my father and gently asked him if he would look through them with me and identify the pictures. I was surprised when he readily agreed, and we set to work on a project that encompassed the next two afternoons and evenings until well past 1 a.m. as he repeatedly urged me to continue on. He agreed to let me take the photos out of the albums as we proceeded so I could match them with my notes and later bring them home to scan and preserve. The sessions elicited not just names of relatives of long ago, but also some stories — when he was willing to reveal them. “She was a nasty woman,” he said, laughing, of one ancestor as he held up the photograph of an unsmiling elderly woman with white hair wrapped in a bun, the collar of a black dress buttoned tightly around her neck. 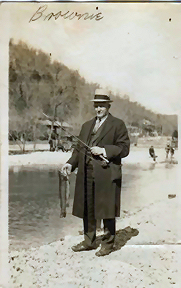 Dad picked up another photo of his grandfather Austin proudly displaying a catch on his fishing line, and he launched into a story about entering a fishing contest upon his grandfather’s urging and surprising himself when he won. 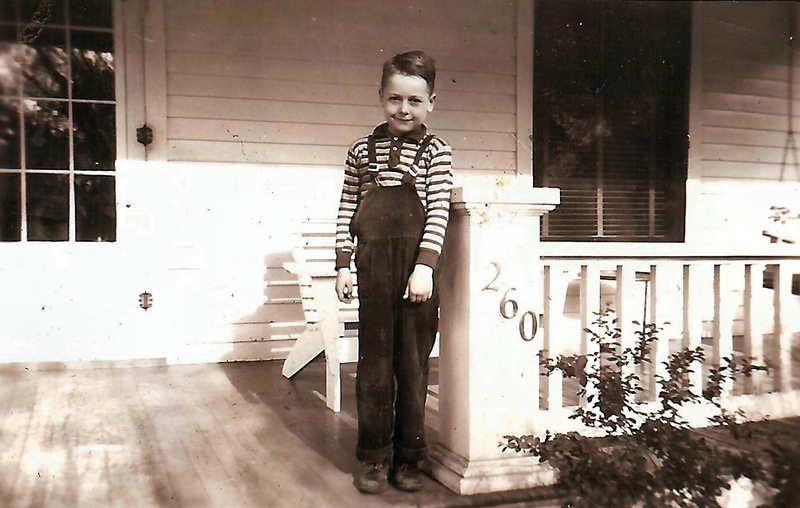 In yet another photograph, Dad stood on his grandparents’ driveway, a towering 6’ young man holding school books and a look of defiance on his face. “What is this?” I asked. He explained that his father had recently dragged him back from the Army, where he had lied about his age in order to enlist. 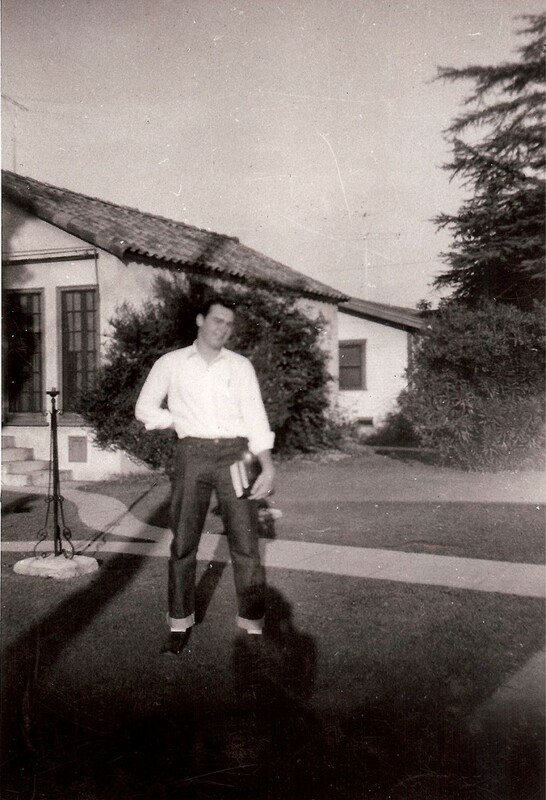 “I was supposed to go back to school that day,” my father said evasively. “Supposed to?” I asked. “Well, what happened?” He responded, “Let’s just say after doing some time in the military, I thought this school stuff all a bit silly.” He was 16. 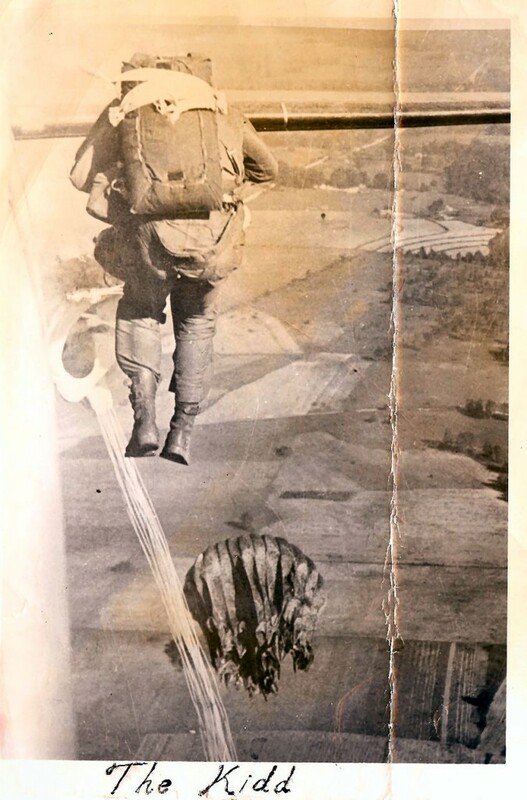 Other stories were more difficult to elicit — particularly those related to photographs in his military album. Some I knew would take some time, and I already started mentally planning for a couple more sessions to revisit the photographs he slipped under other stacks to avoid discussing. At the end of my stay, Dad drove me to the airport. Inside my carry-on were all the photographs I planned to scan, label in a digital file, then preserve in a new acid-free album to return to him. Two nights later at 3 a.m., my husband and I were awakened by a ringing phone. My husband answered, then promptly handed it to me. “It’s your brother,” he said, and watched intently as my brother told me our father had been in a car accident, and he had heard about it on the news. “He didn’t survive,” he said. The shock was overwhelming, sending me sobbing for hours. And for days I felt guilty about spending the time going through memories with my father, as if I somehow knew the end was near or maybe that I had even jinxed things. But at some point I realized how lucky I was to have spent that time with him and, while I didn’t get all of his stories, I got some of them. How many times had I, like others, said, “One day I will sit down with my father and ask him questions about the past”? It taught me not to wait for a seemingly perfect time, which never seems to arrive. Learn more about our personal or family history services, or contact Christy Lyons at christina@bylyons.com.